While currently the city only accepts bottle-shaped plastic containers (i.e., not yogurt or take-out containers), the city will begin collecting all rigid plastic for recycling. This may not happen right away; the new waste is to be taken to an as-yet unbuilt facility in Brooklyn, scheduled to open in 2010. 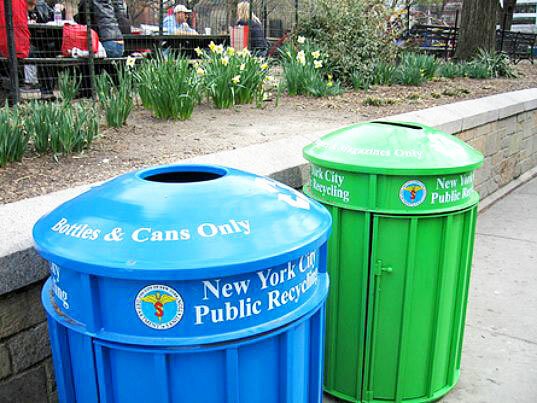 200 new recycling bins will be added on the streets over the next three years, with 700 total to be added over the decade. Other new programs include annual household hazardous waste collections, a clothing and textile recycling program, a trial paint recycling effort, and more composting. The new laws also call for recycling coordinators and more recycling in schools, sustainability coordinators and plans for city agencies, improved education and enforcement, and studies of food waste composting and other recycling possibilities over the next few years. While it will take time for all of this to come to fruition, we’re happy to see the council and mayor work together on issues that will only make New York a cleaner and better place to live.